A Birmingham gang member who fled to Pakistan to avoid gun supply charges has been jailed. 36-year-old Kumran Ghalib was arrested in January off a flight into Birmingham Airport. 18 other members of the gang who bought and sold guns have got 200 years in jail between them. 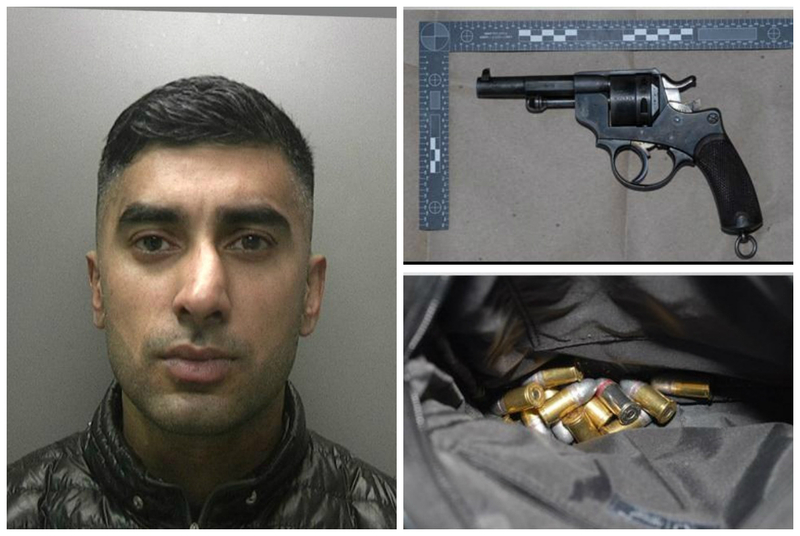 The court heard how Ghalib, from Raglan Road in Smethwick, stored a French St Etienne revolver and ammunition which was due to be handed over to customers on 16 January 2015. He kept hold of the weapon at a family address in Aston in the hours leading up to the sale and then passed it over to other gang members who completed the delivery. But police intercepted the transfer as it took place – news that quickly got back to Ghalib, who then made hurried arrangements to leave the country before officers were able to make the link. Detective Chief Inspector Sam Ridding, from Force CID, said: “We have now completely smashed what was a highly-organised and extremely dangerous gun supply network. “The only one who didn’t get arrested at the time – Kumran Ghalib – probably thought he’d got away with it, but we never forget about people who bring misery to the streets of our city. “We knew it was only a matter of time before he would want to come home to his family and as soon as he got on a flight back from Pakistan we made sure we were ready to lock him up.